Crocodiles and alligators have always been one of humankind's most feared predators. Around since the days of the dinosaurs, they are probably the source of myths about ferocious serpents and man-eating dragons. All tall tales aside, these reptiles remain fascinating creatures. Did you know that crocodiles and alligators eat their food without chewing? Or that they use the sun to regulate their body temperature? 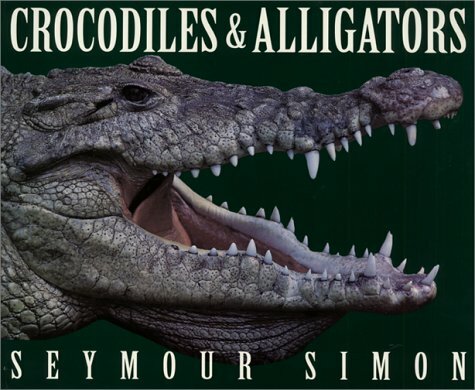 Renowned science writer Seymour Simon's accessible text, and full-color photos, provide a stellar introduction to these reptile wonders. Outstanding Science Trade Books for Children 2000--selected by Natn'l Science Tchrs Assoc. & Child. Bk Cncl. Seymour Simon has been called "the dean of the [children's science book] field" by the New York Times. He has written more than 200 books for young readers and is the recipient of the Science Books & Films Key Award for Excellence in Science Books, the Empire State Award for excellence in literature for young people, and the Educational Paperback Association Jeremiah Ludington Award. Mr. Simon lives in Great Neck, New York.